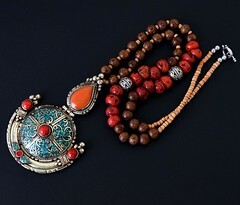 Tibetan ethnic Nepali pendant necklace inlaid with Coral and Turquoise mosaics, loved as gypsy, boho,hippie style jewelry. The beads used in making this necklace are antiqued raw coral, textured wood and coconut wood barrel beads. Traveling many miles, made by the dwellers of the Himalayan mountainous region. The inlaid stones used in this gypsy, boho style necklace are Turquoise and coral mosaics, the traditional stones used by these artistic people, inlaid on this necklace by hands which gives the surface a smooth touch. The main pendant is the center piece of the entire necklace, also inlaid with Turquoise and Coral mosaics and a round piece of Amber stone. People living in this region are mostly Buddhists, who firmly believe that the stone that they use in their jewelry contains healing powers, blessed by the Buddha. Typically Tibetan Silver is used in their jewelry, which is a mixture of some element of silver and other metals.